Almost eight years ago to the day was one of the worst days of my life. The business I had started 2.5 years earlier was on its last leg. It wasn’t just that we weren’t making money, but we were losing enough money that I started to question whether our family would have enough to pay certain bills. The downtrend was apparent, but on this day … nail met coffin. This was the day that one of our biggest clients, the one we delivered our best results to and was the most revered of all our case studies, decided not to renew our service (we provided qualified leads for content agencies). I called the client, received the “official” word, and hung up the phone. In a daze, I walked out of my home office, and then wandered outside and into the yard. I can’t remember how long I was back there … it could have been five minutes or five hours. I could hear my two boys (then 8 and 6) laughing from inside the house. I think they had just come home from school. What would I do? What would we do? It’s a strange feeling when you feel deeply sorry for yourself. Maybe you’ve felt it before … failure that rolls onto you like the ocean waves. Slowly, it overtakes you. Looking back on it now, it all seems so silly. I mean, this is the definition of a first-world problem. Sure, it wasn’t nice, but it wasn’t the end of the world … except that’s exactly what it felt like. I guessed I’d just go back and get a “real” job, which was fine except for the fact that I was unmanageable. I left an executive position 2.5 years earlier, put the shingle out, and vowed I’d never do it again. And here I was, considering going back to the corporate world. A few days went by. I promised myself I wouldn’t make any decisions while in an emotional state. That week I received an email from one of our blog subscribers. She worked at a fairly large B2B company. She said she absolutely loved the blog and felt like she found her calling around content marketing. She’d been doing content marketing for years but called it something else. She was glad there was a name for it now. Regardless, she wanted to implement a strategy and process in her company, and wanted to know if I could help. “That’s nice,” I thought … a consulting gig would help. Then, for whatever reason, I started going through all the emails I’d received from subscribers over the years. The content marketing blog I started in April 2007 was really taking off, and the audience was anything but shy. And there it was … email after email, the audience telling me what they would buy. While I was so busy trying to perfect a failing product, the answers were right in front of me. The proverbial lightbulb had been switched to the “on” position. In three years, we will run the leading online destination for content marketing, the leading content marketing magazine, and the largest content marketing event on the planet. Just over six months later, in May 2010, Content Marketing Institute was born. The concept took off immediately. People came to the site. Social sharing was off the hook. It was hard to believe it was working. Michele Linn bought into the vision and took over editorial. Robert Rose, always open to a disruptive idea, assisted with the vision and agreed to run consulting and training. Pam Kozelka, my wife and co-founder of CMI, took over all the operations so I could sell, speak, scale, and write. Joseph Kalinowski brought his design chops. Chief Content Officer (CCO) magazine launched in January 2011. Clare McDermott, who for whatever reason agreed to edit the magazine, took charge of the brand with Angela Vannucci who became the project director. I called Kelley Whetsell, event director extraordinaire, and explained to her the vision for Content Marketing World. She reserved a small space at the Renaissance Hotel in Cleveland, Ohio, based for 100 to 150 people. I honestly didn’t know if we could attract 100 people to Cleveland for a small content marketing conference. Just a few months later, 660 people showed up at the conference and we were bursting at the hotel’s seams. Cathy McPhillips came on to run marketing. Lisa Beets agreed to run our annual research. Peter Loibl agreed to come over from Crain’s to run sales. Laura Kozak formalized a process for the website. Jodi Harris came on to help Michele with the blog and our content projects. Mo Wagner brought her social media savvy. Amanda Subler generated more buzz around content marketing than we could possibly imagine. As we scaled, we added more talent, but even better human beings like Kim Borden, Karen Schopp, Lisa Dougherty, Krissy Leskovec, Dave Anthony, John Hanson, Wally Koval, Ann Gynn, Marcia Riefer-Johnston, and many others. By the fall of 2012, just two years after the worst day of my professional career, we had achieved our “cocktail-napkin” mission, and indeed built the leading online destination for content marketing, the largest magazine property, and the largest in-person content marketing event in the world. I love the CMI team. They are family to me and always will be. But I tell you this story because, to put it simply, CMI exists because of you. CMI would not be “a thing” without you … your feedback, your honesty, your ability to challenge the status quo. When I teach people about what it takes to build an audience, I don’t think of an audience as a nameless, faceless crowd. I think of Andrew Davis, Jay Acunzo, Ann Handley, Ardath Albee, Jay Baer, Arnie Kuenn, Ahava Leibtag, Jesper Laursen, Kazuo Watanabe, Pam Didner, Pamela Muldoon, and so many others. I think of the time Andy Crestodina stalked me at Content Marketing World 2012 to hand me a printout of his Content Chemistry book (I still have it, Andy). 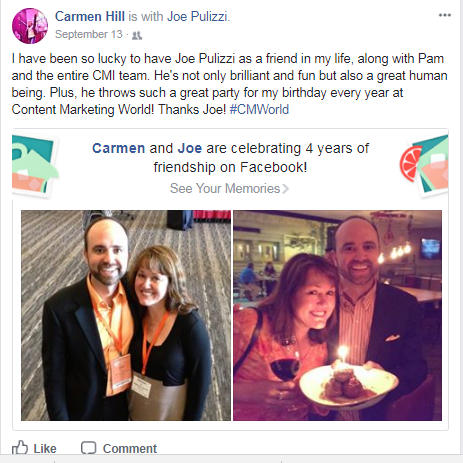 I think of Carmen Hill and how she always willingly spends her birthday at CMWorld every year. I think of Marcus Sheridan, an incredibly raw and talented speaker that we gave 20 minutes to in 2011 … who became our keynote in 2012 and went on to affect so many people around the world in such a positive way. I think of amazing moments like Pam and I crying behind the curtain before I went out on stage for CMWorld 2011, and how two days later three delegates came to me crying and disappointed for having to listen to that vulgar Kevin Smith performance (yes, that happened). 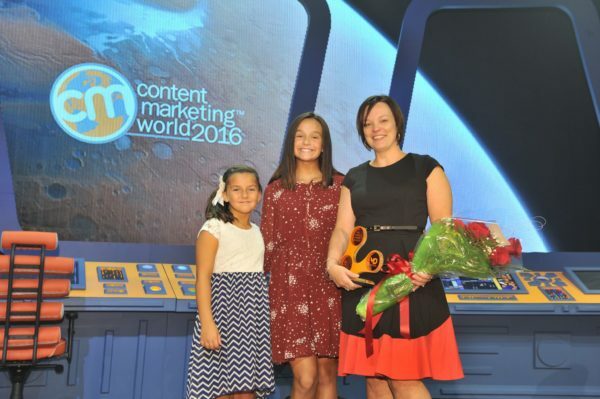 And I’ll never forget seeing Amanda Todorovich’s face when she received Content Marketer of the Year, presented by her two beautiful daughters. Content marketing has become a real, professional practice … maybe the most important practice in marketing, because you had the strength and courage to seek out a better way to communicate. You believed that marketing, as we knew it, was broken and there was (is) a better way. Being witness to this and being able to serve you has been a wonderful and humbling experience. It’s a gift … one of the greatest gifts I’ve ever received. I don’t know if I’m deserving of it, but I will accept it nonetheless. You are smart, so you’ve probably seen where this is heading (if you didn’t already scroll to this part of the story). Starting Jan. 1, I will be ending my active role in CMI operations. On that exact date, I’ll be taking a 30-day, internet-free sabbatical and spending every possible second with my family. After that, I’ll be taking some very special (bucket list) trips with members of my family and will be working on some non-marketing writing projects (and other shenanigans). I’ll also be increasing my involvement in our nonprofit organization, Orange Effect Foundation, and will continue to raise money for children who desperately need speech therapy and technology equipment to help them communicate more effectively. I’ve been given a very rare gift in that I can step away and focus on some things that I may have been neglecting over the past few years. As Alexander Hamilton says in the musical Hamilton, “I am not throwing away my shot.” My plan is to truly lean in to this and see where the journey leads me. Some community members may not know this, but CMI was acquired in June 2016 by UBM, one of the most successful event and media companies in the world. UBM saw amazing value in the business, and CMI found a wonderful home. The partnership with UBM is the reason I have the opportunity to take some time off. Hopefully you’ve noticed that there haven’t been any changes to the CMI team operations or the way we interact with the community. UBM has done a great job in continuing in the spirit that Pam, I, and the rest of the team started so many years ago. So, while I, of course, will be at Content Marketing World in 2018, I’ll be moving away from my other duties, including the podcast. I can do this because, to be honest, I have complete faith in you, the community, and the CMI team. I’m excited to see what you do next, and how our very important mission continues to evolve. It’s never been a more exciting time to be a marketing professional. We are the ones who will define the future business models, not just for marketing, but for our entire organizations. Building loyal and trusted audiences through the delivery of truly valuable information is the key to making this happen. Although I won’t be active at CMI, I won’t be gone. I’m here for any one of you with anything you need, just like I always have been. You just might not be seeing my avatar as much on the site. If you have any questions, please leave them below and I will answer as promptly as possible. 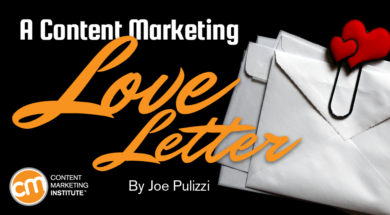 Want to see Joe’s motivational words from Content Marketing World 2017 and learn from hundreds of presenters? 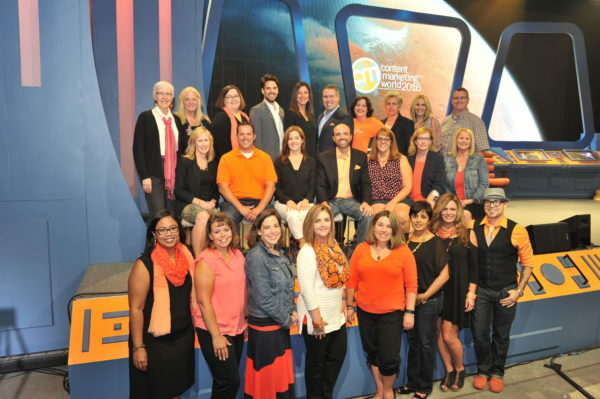 Sign up for CMWorld’s video on demand.